Once you get the remainder of the deck mud packed into the shower and have it correctly packed and leveled just let it set for at least 12 hours, 24 would be better. Really, leave it alone. There is something about a freshly packed mud bed that makes people want to pick at it – it’s alluring – and a bit disturbing. But you need to leave it alone. So quit poking at it. After it sets for about 12 hours you can fine tune it, so to speak, if you need to. Any un-flat spots can be scraped, rubbed, or sanded down to flatten them out. You can use regular sandpaper for this – really. Just make sure you have a flat surface from the wall to the drain. FLAT – not level. You want this surface absolutely flat. If you have not yet done so you can now install your moisture barrier and backerboards. Now that you have a large waterproof box you are ready to install your tile and make it look all pretty. The hard part is finished. As with any proper tile installation the underlying substrates are the most important. Take your time with the preparation, it is imperative. Without proper preparation any tile installation is doomed to fail. And your dog may burst into flames. For detailed information about how to create your curb and tile substrate for it read this: Creating a curb for your shower. I now have manuals describing the complete process for you from bare wall studs all the way up to a completely waterproof shower substrate for your tile. If you are tiling your walls and floor you can find that one here: Waterproof shower floor and wall manual. If you have a tub or pre-formed shower base and are only tiling the walls you can find that one here: Waterproof shower walls manual. I have a customer that wants to have just a concrete finished floor in the shower. My concerns are 1. waterproofing the wall floor intersection, and 2. correct application of floor product ( deck mud, cement, cement-all etc). The second layer has not been installed yet so I am open to any suggestions. Using red guard to waterproof. should I just use the deck mud flush to to the drain and then seal it? Or, Install a thin layer of cement-all (or other product) on top of the deck mud and flush that to the drain. How thick would the cement-all need to be? would I continue the red guard from the walls onto the deck mud and then put the cement all( or other product) on top of the red guard? Or cement-all directly to deckmud and seal on top of cement-all? Build it just like a normal shower with redgard waterproofing on the floor and up the walls, then install the cement-all (or whatever product you’re using) over the top of the redgard. Each product will state a minimum thickness, keep your deck mud that amount or more below your drain, then flush the final product with the drain. Thank you for these write ups, they very helpful and informative. I have a question. After building your curb, installing the water proof membrane, then you “dry pack” the shower floor….what do you put on the curb to attach the tile to since you are unable to attach tile to the membrane, and you don’t want to nail into the membrane. Nevermind….got my answer. My fault! Thank you for taking the time to write these informative posts! I’ve read all your posts and most of the comments and wanted to confirm some points. I’d like to do a traditional waterproof shower. I’ve poured my preslope (over a 4 mil vapor barrier and galvanized lathe) and am ready to put in the 40 mil PVC membrane. .
3. Is it essential to have a gap between the CBU and the top mortar bed for traditional waterproofing? I’d was originally hoping to embed my CBU into the top mortar bed to mark my mortar screed height at the wall. Most other articles I’ve read embed the CBU, and in your part 4 post you mention it can be done either way, but there was another comment that suggested not embedding the CBU for traditional waterproofing due to the CBU wicking moisture up the wall. 4. Does it matter if I lay down the shower curb fat mud first vs. laying down the top mortar bed first? How do the two bond together (assuming the first is dry when the second is laid down)? I planned to do the curb first so I can lean on it when I lay down the top mortar bed without worrying about puncturing the PVC liner. 5. Do you suggest installing lathe between the PVC liner and the top mortar bed? Or just lathe on the curb? Thank you so much in advance…I couldn’t have gotten this far without your advice and knowledge. 1. Yes, you still need the plastic vapor barrier. 2. Fiberglass mesh with tape, the barrier is your waterproofing. 3. You can do either, I leave a gap. But you can embed it as well, it’ll work just fine. 4. No, it doesn’t matter which order you do it. They do not ‘bond’ together. 5. Unless your shower is over 50 sqft then no, do not install lath above the liner. Just on the curb so the fat mud has something to hold onto. If I have to use cement board for something I prefer hardi. About the only thing I use durock for is large format stacked stone, usually on exterior applications. It just has more surface area for grip due to the texture. Roger: Thanks for all the great info. You are doing a great service! My situation: I have a new roughed in shower on concrete with in-floor heat and need to complete the shower base so it slopes as required. Unfortunately, I don’t believe I can do the first layer because the PVC drain lower clamp is flush with the existing floor (see attached picture) so there’s no room for it. So I believe I am left with sloping it with one layer of deck mud to ensure I have adequate mud thickness and then painting on RedGuard. I shouldn’t need the tar paper under the deck mud because no condensation with a heated floor?? Your help would be appreciated. Thanks. You don’t put tar paper under deck mud over concrete. It’s not needed, that is only to prevent plywood from leaching moisture from the deck mud. Concrete doesn’t do that. This is very good and easy to read, to gain this knowledge. I know that the guys installing my tile shower from the bottom up are not doing it right so I am having to supervise them to ensure it will be done correctly. Thank you. And you are funny. My contractor is installaing a pvc liner over plywood and then a sloped mortar layer and finally redguard applied to the top of the sloped mortar before applying the floor tile for the shower. I’m trying to figure out if this will work. Some of your three comments suggest a single sloped mortar layer with a red guard coating on top is an acceptable substrate for a shower tile floor. At what point do you form the curb and apply Fat Mud over lathe? Before you do the final bed or after? I create the curb, then do the preslope, then form the curb with fat mud over the lath, then do the top slope. I just discovered that I used premix stucco patch (DAP) for the bonding layer where i added more top deck mud. I corrected the slope yesterday without checking the label. I thought I was using my premix container of Thin Set. I don’t have a dog so he didn’t burst into flames, but do i need to remove yesterdays work and use thin set? 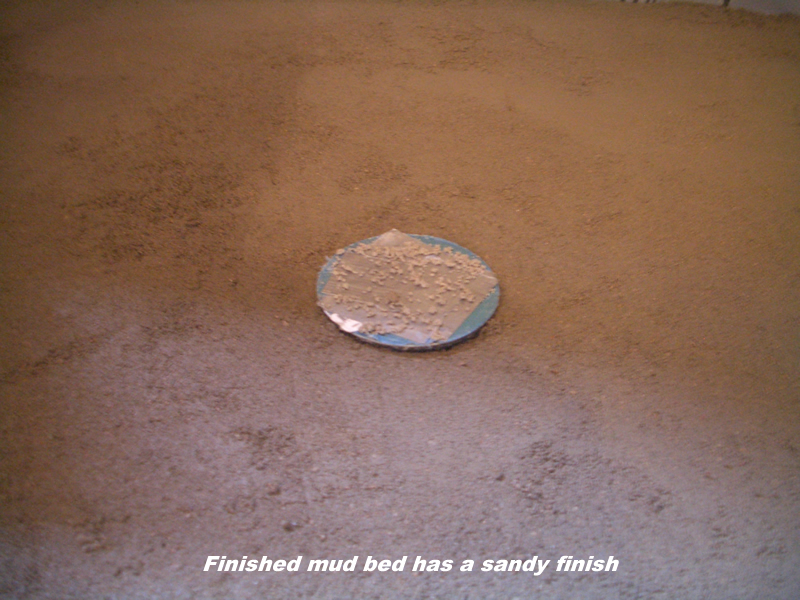 The thickness of the added mud is 0″ – 1/2″, max and covers about 50% of the top pan. Unfortunately yes, I would replace that. And if you’re using ‘premixed thinset’ you need to get rid of that – it’s just mastic with sand in it. You need the stuff in the bag that you mix with water. Thanks for telling me what I needed to do rather than what I wanted to hear. Several blisters and hours later the the Stucco patch layer is removed and I re-leveled the top mud using Thinset (from a bag!) and all is well. The stucco patch was still plyable, which I assume would have left a cushioned spot under the tile and possibly contributed to cracking grout (or worse). Back on track and making progress. Thanks for all the information you have here! Somehow, between measuring up the walls and adding the top mortar layer, I lost some of the 1/4″ slope. What is in place on the floor now… the 15# tar paper, preslope (that IS at least 1/4″ slope), PVC pan liner, 3 foot linear drain, and the top deck of mortar. I still have a small slope on the top deck, but it isn’t 1/4″ to the linear drain. How can I solve this? I was thinking one of these would work…. 1. Can you add a skim coating to the top with thinset to add the slope and let that dry and then tile? 2. Can you just layer the thinset heavier where I need to be higher while tiling? 3. Can you add more mortar on top of the bed once the bed cures? I saw that you could do this on the preslope after adding thinset first. Can you do this for the top bed? 4. Completely rip it out and try again? You can actually do any of those things. Or you can just leave it. As long as it’s sloped the water will drain, as long as your preslope has the 1/4″ / foot ALL the water will drain. Dealer’s choice. This is by far the best site for concise information, much appreciated. Just wished I came across it before installing the floor membrane which after packing the mortar mix on top leaves only about an inch before where the screws penetrate into the wall holding the membrane in place. Also a pretty sloppy job on my part patching an outside corner cut in the shower but is still water tight (assuming the water doesn’t back up more than an inch up the walls). My question, is there any reason why I shouldn’t apply Redgard over the mortar on the floor when I waterproof the walls just to give some extra insurance where I was sloppy? I plan on caulking in the corners and where the cement board meets the floor before doing this. 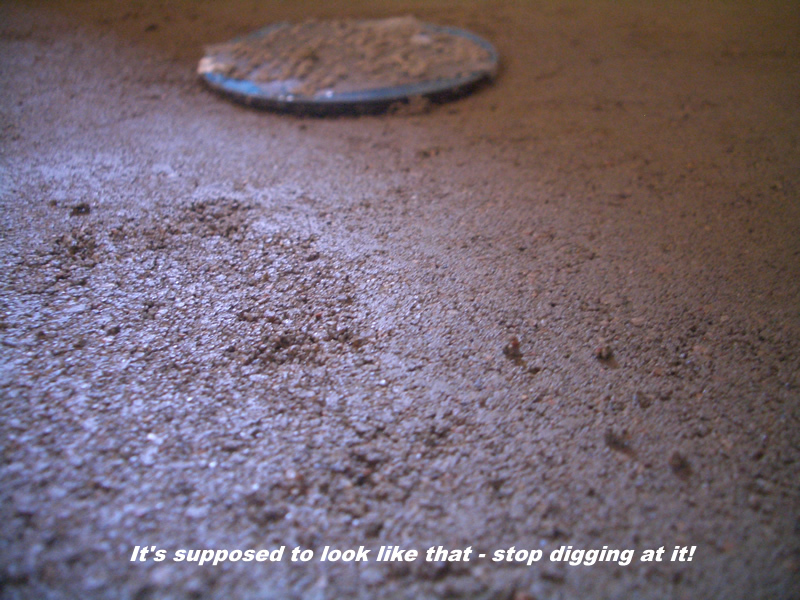 You don’t want a membrane on top of your mud bed if you have a liner beneath. You can paint redgard over those areas only, but you don’t want to completely cover the mud deck with redgard. I have read that you have to tile within 24 hours of putting down your dry pack. Is this true? I did a dry pack of 5:1 and set it, but now its been 3 days later and some litearture I have read says the product goes into a “green state” and that I would have to wait 28 days for it to fully cure before tiling. What is correct? Can I still tile after 3-5 days of setting the dry pack pan? It does go into a ‘green state’, but that is more for regular concrete than dry pack, and it actually has nothing to do with setting tile over it. You can dry pack it and tile whenever you’re ready. I have a concrete foundation home with a step down shower, 3×5. The original drain was cast iron from the 70’s and badly deteriorated, I had a plumber replace the drain. He had to hammer out around the old drain an inch or two into the concrete and down about the same, this area is still open after replacing the drain. Should I thinset the concrete into that area and simply mud it when I do the pre-slope? Secondly I am building a wall to create this shower as a walk in, the order I have been contemplating is pre-slope, liner, top layer then build the wall. This will give me the most room to work on the bed and since it’s sunken it will not reach the wall framing. My only concern is the liner being an issue without being able to nail it to the non-existent wall until it is built. Lastly once all of that is complete, is it normal to walk on the finished mud top layer to install the backerboard and waterproofing membrane (redgard in this case). Or do I need to tile the floor before installing the backerboard/membrane and tile… Thank you for your help, this is by far the most helpful website I’ve found. Oh and also, there will be no curb since it’s a sunken shower, it’ll be about 3 inches from top of tile in shower to the bathroom floor. What should I do with the pan liner at the shower entrance? I am tiling the whole bathroom, should I run the liner three inches or so from the lip of the entrance into the bathroom? I just fill those holes with deck mud as I’m doing the slope. When you do your liner you can simply fold it out until you get the walls built, shouldn’t be too much of an issue at all, just make sure you have the proper folds when doing your top layer so you’re not fighting with it once you get your walls on. You can work over cured deck mud just fine. Run the liner about 3-6″ out under the bathroom floor. 24″ is not ADA compliant, but it is large enough for a shower entrance. Thanks for the information. It’s invaluable for new homeowner. I have a question regarding the placement of my cement board after the last mud slope is finished. Should it go all the way down to the mud, as in, making contact with it? Do I leave a small gap and caulk to fill? Does it even matter? I can seem to find a definitive on this anywhere, just lots of opinions! Small gap, left open (no silicone) is best. Roger – Basement shower (concrete floor w/ builder drain rough-in). I drilled out 1/2″ depth around the drain pipe to allow the drain base to sit below the floor a bit. That meant a thicker than usual pre-slope – 2″ at lip of drain base. Liner went in just fine and flooring will be 3/8″ marble tile. I want to cut back on the depth of the mortar layer (say to 1/2 – 3/4″ deep) to avoid having the finished floor be excessively high above the bathroom floor. When screwed down all the way, the barrel/strainer is 1″ above the clamping ring, so I think the math allows a thinner mortar layer. Is there a structural or code reason why the mortar layer is recommended to be 1 1/4″ min? Another thing: using Durock on walls/ceiling, 16″OC studs and Durock screws about every 4″ to support marble tile weight. Mesh taped seams and 2-3 coats Hydroban over the whole thing. Is this design sufficient for 12×12″ marble on walls AND ceiling? Thanks! You can get away with 1/2″ – 3/4″ at the drain for your top slope. 3/4″ would be better, but 1/2″ will suffice if need be. Yes, your substrate as you’ve described it will be fine for both walls and ceiling. As I’m waiting on my bench question response – I just read Part 5, and it says “ensure that the line of the floor is straight from the wall to the drain” that implies you are making that finished layer level. I think you may not have been as clear as you want!! Are you implying that you want the thickness to be the same – but still have the same slope to the drain. Please correct me if I’m not understanding your instructions. The finish layer will not be level if your preslope is already sloped, as it should be. The edges of the preslope sit 1 – 2″ higher than the drain (depending on your shower size), so it’s sloped. If you place a consistent 1″ thickness of mud over that from the wall to the drain, in a straight line, it will still be sloped 1/4″ per foot. I just wanted to clarify a point or two in my original post. When the tile was easily pulled up, it was because the thunder came up with it taking a varying later of the deck mud. I also found I wore a depression down to the liner from my walking on it and some minor brushing away of debris. I just wanted to say thank you for time and effort put into this site. I’ve found it to be the most comprehensive on the web as it applies to shower mud pans. I’ve followed your steps to a successful shower install! Best of luck, and I’ll recommend this site to anyone that asks about this type of installation. thanks again for all the help! One thing I’m still wondering about, how do we secure the membrane to bricks if we are using them for the transition on a cement slab shower install? Do we need to put backer board over the bricks and membrane? No, you use the lath to wrap over the curb and liner, then the mud on top of that. Once it’s cured you tile directly to it. Thanks to you the curb has been built, shower has been constructed with Hardiebacker (and some screws and such), water proofed with Regard, and it just passed the 24 Hour Flood Test with Flying Colors. So now the fun begins, but I have a question on the ACTUAL tiling of the Shower. We are using Travertine for the everythingr, including the ceiling. Since there are no “Bull Nose” pieces to use at the edge of the bench, how should I proceed? Also, what about at the top edges of the curb? I was thinking of mitering the pieces, but the stone does not want to make a perfect cut, even after I filled all the holes in the back and let it dry. Not to mention there would be a compound miter cut which would not be easy with my saw. Anyway, should I just make the top the widest point, and have it overlap the sides? Only have a 1/16th grout joint, so its not like you can see much, but obviously the side of the travertine is not honed, so it does have a different look. Hopefully you are not on vacation, or not feeling well, as I could really use some help on this ASAP. Typical client, we want it yesterday, we want it free, and we want it perfect. I will be sitting in the corner with my “sippie” cup full of Chardonnay because I am sure this comment is making me sound like I should be. You can actually just overlap the top over the sides and grout it all. It’ll look completely normal. Quick question, should I embed my Hardie backer, or should I install my Hardie backer above my deck mud? If I do topical waterproofing, I embed it. If I do traditional waterproofing I leave it about 1/4″ above the top mud deck. Could you very briefly describe the difference between the two, or direct me to where it has been discussed? Also, besides the difference in how you install the backer board, does traditional vs topical have other implications for the overall shower pan install? With a topical membrane the waterproofing membrane has to be a solid, continuous coating from the wall onto the floor, so I have the backer embedded into the mud to give me continuous, solid backing for my membrane. With a traditional waterproofing the bottom of the board is bare – it will wick water UP. Although there is a vapor barrier behind it and it won’t make a difference, I simply prefer to have that gap in there to prevent it. On the right side of the page you can enter your email and the elves will send you a free downloadable pdf which explains, in detail, the difference between the two waterproofing methods. Here’s my dilemma. I’m planning on using Hardibacker backer board with redgard topical waterproofing over it. I intend to build a traditional shower pan (tar paper, galvanized mesh, pre slope concrete layer, waterproof liner, top concrete layer). 1) Do I need a moister barrier behind backer board? Is this overkill? Does this have the potential of trapping moisture between topical moister barrier at front and the moister barrier behind the substrate? 2) Should I embed backer board in top concrete layer, or position it slightly above concrete layer? 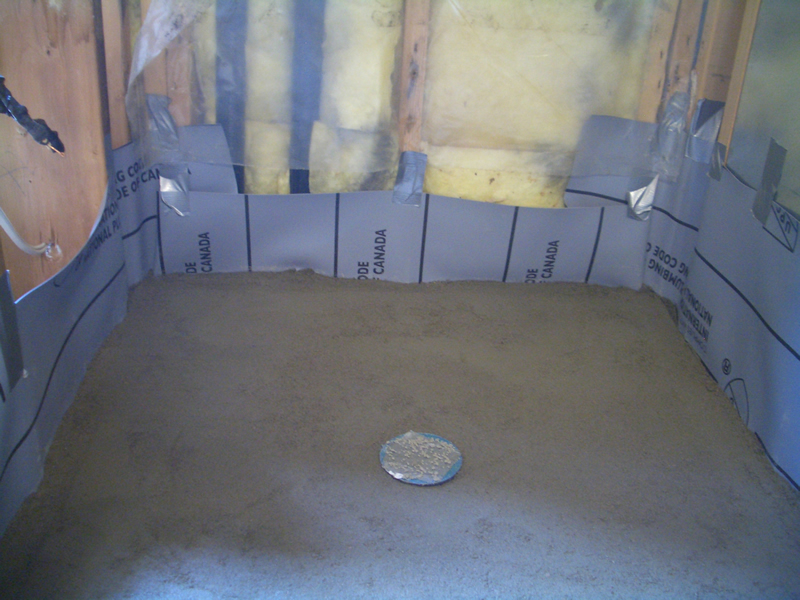 3) Should I apply topical moisture barrier (redgard) over the top concrete layer in a traditional pan, or does this create the potential issue of trapping moisture once again? 1. No, you do not want the barrier behind it if you use redgard on the walls. It will actually create problems. 2. No, you want it above the mud bed, for the reasons I mentioned above. 3. No, that creates the same issue as the walls with the vapor barrier behind them. Do I embed the durock into the top mud bed? Or do I leave it 1/4 of the top mudbed? You can do either. If you embed it you need to paint the redgard out onto the floor about six inches around the perimeter. Hi Roger, you are the best! My wife and I would not have had the courage to tackle this intimidating project if not for reading your manuals. We appreciate it! We have put in our shower curb on the basement concrete floor using bricks. We created our pre-slope and it seems to be sloping all the way around, though not consistently 1/4″ per foot (all of it is a 1/4″ or more, but no less, and we are hoping this is ok). We are putting out liner in now and we think we will be ok there. #1 ~ Once we put our top layer mud pan in, can we let it dry for MORE than 24 hrs while we do the endless search for tile? #2~ What are we laying our tile with; just use the thinset that we use on the walls, or something else? Unless your shower is a perfect circle with the drain in the center you will always have 1/4″ or more slope. 1. Yes, it can cure for as long as you need before tile, provided you’re not stomping all over it. 2. Your regular thinset that you use on the walls. My husband and I are weekend DIY-ers and this is our first time building a shower pan. I think we mixed our deck mud slightly wetter than yours…it was just wet enough to leave a moist residue on my hands. I packed it in really well, but I’m worried that I didn’t do a good enough job of smoothing it out after packing it down. Most of the area looks like your pictures, but I think we’ve got more ‘sandy patches’, especially at a couple spots close to the drain. I know you said it’s normal for the mud bed to have a sandy finish, but we’re a little concerned that ours is too sandy in certain spots and the floor tiles won’t have a solid enough surface to bond to. Is it easy for the surface to finish too sandy? Would this be problematic for installing the floor tiles and if so, is there something we can do to improve it at this point before laying the tile? Lack of thorough mixing would be the only thing that would give you sandy patches in only certain areas. You can skim-coat over the entire pan with thinset, let that cure, then install your tile (or waterproofing). It should be just fine unless it’s actually the density of a pile of sand (no bond together at all). In which case you can remove those parts, go over it with some thinset to bond and pack some more deck mud into those areas. Sorry roger figured it out. Makes plenty of sense now. Hey roger thanks for all the help had a question….. Yes, you still need that slope. What I mentioned is not needing it to be thicker on the perimeter. If you have a proper preslope in there your top slope will be a consistent thickness, you’ll still have the 1/4″ / foot.